When you fertilize you are adding nutrients back into soil that has been depleted. To add nutrients back into your soil, mix in organic matter like chopped up leaves, compost, and/or TGP Choice Garden Mix along with fertilizer to your flower beds and vegetable gardens. All fertilizers have a combination of 3 numbers on their package. These numbers are a kind of shorthand to indicate amount of nitrogen, phosphorus and potassium (N-P-K) contained in each fertilizer in that order. Nitrogen (N) promotes plants growth above the ground while Phosphorous (P) promotes healthy root systems. Potassium (K) is good for overall plant health. So that means different plants need different ratios. For example, you would not want to give your tomatoes a big dose of nitrogen. This encourages leaf growth and you want your tomatoes to focus on growing tomatoes, not leaves! It’s easy to think that the larger the number the better a fertilizer will work but, that’s not always the case. Different plants have different requirements and higher numbers don’t necessarily mean it will work better. Too much fertilizer can burn plants and damage the surrounding soil. Slow release fertilizers are also a good way to regulate the N, P, and K released. Be sure to read the labels of any fertilizer you will use before applying it to your lawn or garden. If you are unsure of how much and what combination, it's a good idea to get your soil tested. This way you can add the right combination of N, P, and K for your garden and plants. We recommend the Espoma® line of fertilizers. All of the “Tones” are organic, slow release fertilizers that are safe to use around pets, kids and wildlife. 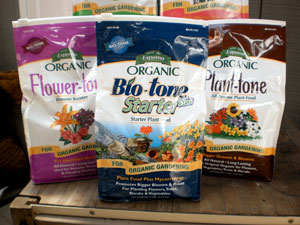 Bio-tone Starter Plus (4-3-3) is an all natural organic plant food with beneficial bacteria and mycorrhizae. It helps plants get established quicker and grow deeper roots. You can add it to your beds when you are adding amendments or mix it in with the backfill soil when you plant. If you’re wondering what mycorrhizae are, here’s what you need to know: Mycorrhizae are a group of fungi which form a mutually beneficial relationship with plants. They can grow inside a plant’s roots or attach to the root surface. The fungi will get food and nutrients from the plant and send their hyphae (sort of like small roots) out into the surrounding soil to also absorb nutrients and water. Mycorrhizae can enhance a plant’s ability to take up nutrients and water. Bulb-tone (3-5-3) Fertilize in spring, once the plants have sprouted to about 6 inches tall or wait until after they bloom. Organic Bulb-tone is low in nitrogen and has a higher amount of phosphorous which is perfect for bulbs. Bulb-tone is formulated and fortified with microbes to create a healthy soil and environment for bulbs. You can also apply in the fall by sprinkling Bulb-tone around the bulbs to ensure they come back stronger the next year. Dahlias and gladiola can be fed monthly. Flower-tone (3-4-5) is a slow release fertilizer that’s formulated for annuals and perennials to help promote blooms. You can add it to new flower beds by mixing it into the top 4 or 5inches of soil at the rate of 4 pounds per 80 square feet. You can also feed established plants monthly from the beginning of the growing season until the middle of September. Garden-tone (3-4-4) is a slow release fertilizer that gives all your vegetables safe, continuous feeding with Bio-tone beneficial bacteria. When preparing gardens for vegetables or tomatoes apply 3 1/2 pounds of Garden-tone per 50 square feet and work into the top 4 to 5 inches of soil with other amendments like TGP Choice Garden Mix and compost. Organic All Season Lawn Food (9-0-0) is made from feather meal and poultry manure with Bio-tone microbes to promote faster greening, deeper roots and better soil structure for a lawn that is better able to withstand the stresses of heat and drought. It can be used any time of year on all lawns including newly seeded and sodded areas. A 28 pound bag covers 5,000 square feet. Plant-tone (5-3-3) is an all purpose plant food with Bio-tone beneficial bacteria. You can use it on lawns, garden beds, new plantings, established plantings and even potted plants. Rose-tone (4-3-2) Most rose fertilizers contain nitrogen, phosphorus and potassium. Rose-tone also contains 12 more micronutrients roses need, including iron, calcium and magnesium in a slow release formula. For established roses in beds, spread 6 pounds of Rose-tone per 100 square feet. For individual roses, use 1 1/4 cups of Rose-tone per plant. Sprinkle the granular organic rose food around each plant out to the widest branch. Then, scratch the food into the top 1” of soil. If you’re planting new roses, add a mixture of TGP Choice Garden Mix and 3cups Rose-tone into the backfill soil. Tomato-tone (3-4-6) is formulated with calcium to help prevent blossom end rot and to produce consistently plump, juicy tomatoes. To plant tomatoes with dig a planting hole for seedlings larger than the plant container and add about 3 tablespoons of Tomato-tone into the backfill soil. Bury the seedling deeper than it was in the container – up to the first set of leaves. You can also apply Tomato-tone after the plants have become established about twice a month during the growing season. Keep the Tomato-tone at least 3 inches from the stem.